Worms are wriggly, disgusting and dangerous, both to our pets and our family. While some pets, particularly those that are older, may not many outward signs that they’re infected with worms, there are signs you can look out for which may help you catch a worm infestation sooner rather than later. Although more common in dogs, this can also be seen in cats. If your pet is ‘scooting’ (dragging their bottom along the floor) it could be because of worms or worm eggs irritating the area around the bottom and making your pet feel uncomfortable. If you see what looks like grains of rice in your pet’s faeces, this is an indicator of tapeworm. This ‘grain of rice’ is an egg-filled segment which are shed when a tape worm matures. Once out in the open, it dries out and breaks open, releasing eggs into the environment. A worm infestation can cause both of these, which can lead to weight loss and lack of condition. However, diarrhoea and vomiting can also signify other problems, so you should seek veterinary advice if your pet is suffering with either. Roundworms feed off the stomach contents of your pet, so an increase in appetite could be a sign of worms. Equally, worms can make your pet feel bloated and uncomfortable, leading to loss of appetite. If you notice a change in your pet’s appetite, particularly for an extended period of time, they should be checked by a vet. More obvious in kittens or puppies, a heavy intestinal worm infestation can cause bloating leading to a pot-bellied appearance. If you pet is infected with worms, you may find they are less active than usual. Worms can cause your pet’s coat to become dry, dull and could even lead to fur loss. Roundworm and Lungworm larvae migrating to the lungs can irritate them and cause coughing. My pet has some of these symptoms, what should I do? If you see any of these symptoms you should seek veterinary advice. You will need to establish for certain if your pet has worms, and if they do exactly what type of worm they have. Treating for roundworm will do your pet no good if they are in fact suffering from tapeworm. Worms are particularly dangerous in kittens and puppies due to their immune system not being fully developed. A serious infestation can cause intestinal blockages which can sometimes lead to death. How can I avoid worms? As a general rule, adults cats and dogs should be wormed at least every three months – that’s one treatment for every season. If you have young children, or a cat who hunts and eats prey regularly, and you are concerned may put your pet or family more at risk, speak to you vet to see if you should consider worming more regularly. 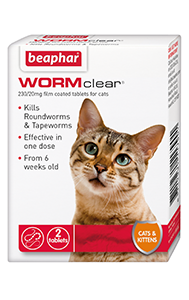 Beaphar wants all pet-owners to become seasoned wormers, and to commit to worming their pets once every three months. 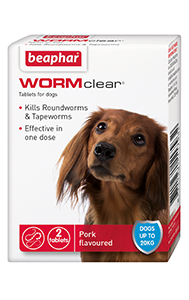 By sticking to a regular worming routine you are helping to reduce the spread of worms to both pets and people. 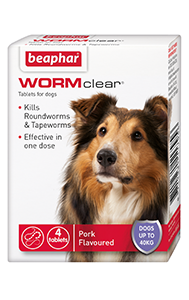 If you would like more information about worms, you can visit Beaphar’s dedicated Worm Awareness Website, which is packed with helpful information and product suggestions to help you win against worms. You can find out more about our WORMclear® range for your dog or cat by clicking the buttons below. You can also visit our retailers section to find your nearest store. Does my cat have worms? All cats are susceptible to worms from the moment they are born. Find out more in our latest Worm Awareness Blog!